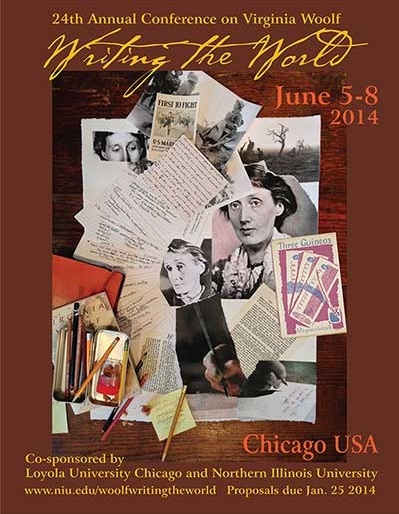 The 24th Annual International Conference on Virginia Woolf, co-sponsored by Loyola University Chicago and Northern Illinois University, will take place in Chicago, USA, 5 – 8 June 2014. We invite proposals for papers, panels, roundtables, and workshops on any aspect of the conference theme from literary and interdisciplinary scholars, creative and performing artists, common readers, advanced undergraduate and graduate students, and teachers of Woolf at all levels. Deadline for proposals: 25 January 2014. Email proposals by attachment in Word to Woolf2014@niu.edu. For individual papers, send a 250-word proposal. For panels (three or four papers, please), send a proposed title for the panel and 250-word proposals for EACH paper. For roundtables and workshops, send a 250- to 500-word proposal and a brief biographical description of each participant.